The 2015 Rogue sets itself apart from most compact-SUV rivals with a continuously variable transmission and fuel economy of up to 33 mpg, stylish yet mature design, and an available - albeit cramped - 3rd-row seat. Also alluring is its sub-$24,000 starting price. The lower-priced Rogue Select carried over from last generation also remains for sale. 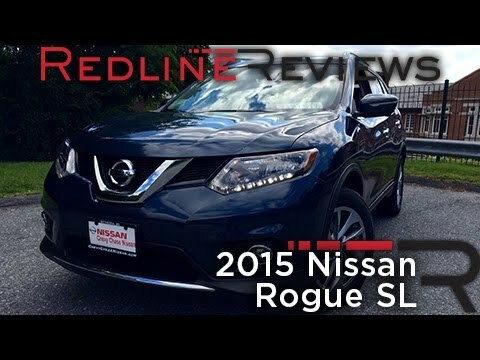 2015 Nissan Rogue all around nice vehicle. I have always had Nissan cars, specifically Nissan Rogues. I had an '09 Rogue for many years before switching over to my '15 Nissan Rogue a few years ago. Being a newer vehicle, aesthetically it is beautiful. I love the design and the way the paint is finished (mine is navy blue, but looks slate or purple depending on the lighting). The headlights are very bright, but I am told no offensively so, like most new vehicles. Inside I have heated leather seats and a sun roof. The radio system is touch, and there is a CD slot and hookups for aux. I do believe it has the ability to connect to Bluetooth if you use your phone for music, but I have never tried to do so - it does not seem like something that is quick to set up and I have never put the time aside to figure it out. It drives beautifully on the road, I barely feel any bumps and the seats are very comfortable. My back seats fold down if I need to transport something large in the trunk, but I rarely need to do so because the trunk is so spacious. The one thing that I hated about having a newer vehicle was availability of parts. Several months after I purchased my '15 Rogue, I got a flat tire that couldn't be patched. I had to go to multiple (think 4-5) auto shops to try to find the correct tire that matched, which was priced at about $300. And because I have AWD, it was recommended I change all 4 (luckily everything was so new I could kind of get away with only changing the one). Now, a few years later, I anticipate that this is not so much of a problem. Another thing to consider specifically about the '15 Rogue is that it takes a higher grade oil, like most newer vehicles, so oil changed can be a bit pricier than anticipated. Comfort meets safety and reliability! The performance of this vehicle is very good. The rear back-up camera is one of my favorite features and is very helpful. It is also extremely comfortable. I went with a black cloth seat, and it is very soft and comfortable. I also like that it does not stain easily and it is easy to clean. The center console between the driver and front passenger is very spacious and allows me to conspicuously hold much of my belongings. The back seat is very spacious and has air vents that can be controlled by the back seat passengers. The steering wheel has all controls that you would need at the tip of your fingers, such as radio station control, radio volume, cruise control, windshield wipers, car maintenance, car settings, and more. The outside design of the car is very attractive. For an SUV it is not overly large, yet it is big enough that I feel safe driving in it. The car is very comfortable and spacious. I have moved multiple times using my car as a main source of loading and can fit a lot in it but putting the seats down. I have even made a bed in the back seat on a road trip by putting the seats down and it comfortably slept two people. My biggest downside is that the tires that came with the car lose air very easily. I am frequently putting air into the tires. I have never had any technical issues with the car that I can recall and have owned it for over three years. Phone sends automatic messages "I'm driving" once a text message comes in while your phone is connected to the Bluetooth. It has some good features, it is Bluetooth enabled, must functions you can access from the steering wheel. The trunk space and interior space is decent. The second row is doable and allows transport of large and/or odd shape items. An automatic message goes out when a text message is received while the phone is connected to the Bluetooth, I wish I could turn it off as it is sent whether or not you are actually driving once you're phone is connected to Bluetooth, some people respond weirdly because they don't know it's an automatic message, and it can also be an invasion of privacy. The oil change reminder can be set, and it shows you the tire pressure and gives warnings when low. When filling the tires with air, the horn beeps when you've reached the correct PSI, that's cool.